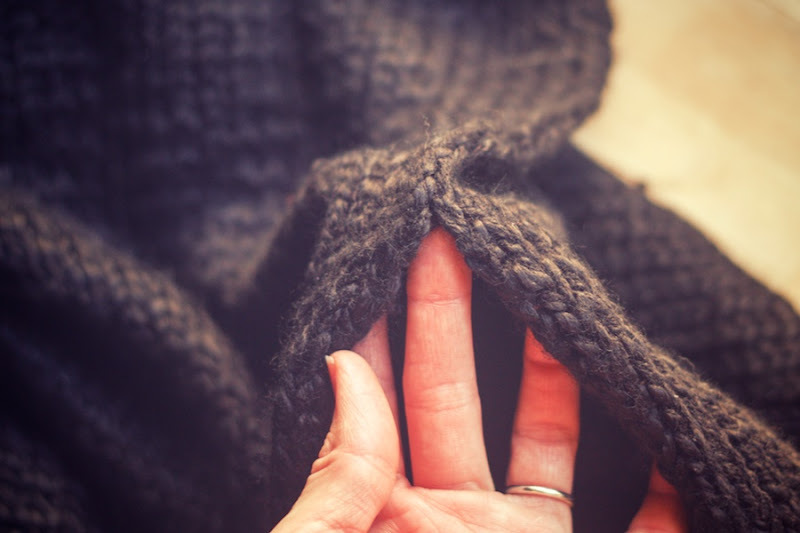 Years ago, I read an article about recycling thrift store sweaters by Ashley Martineau. I promptly went out and bought a rubbermaid tub full of thrift store sweaters to unravel. Two moves and maybe eight years later, I finally cracked the tub open and picked a Target wool/blend sweater for recycling into the Black Swan pattern. I followed Ashley's directions loosely because I had a headache and had trouble finding the right strand of yarn without really strong light. But it still produced several big balls of yarn. 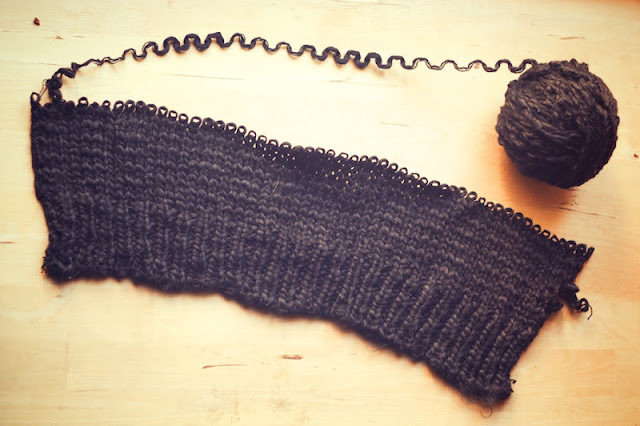 I started with a side seam at the bottom, where the two sides meet like side-by-side braids. 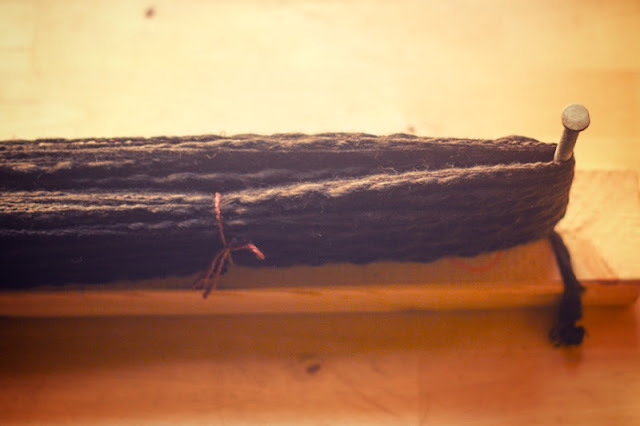 I clipped the ladders of yarn between the two "braids" or edges of each side. I worked on around the shoulder until the sleeves were separated from the body. I, then, separated the turtleneck and undid each sleeve seam. Of course I clipped bits I shouldn't have and so had a few more separate balls of yarn than I'd like, but it was no big deal. 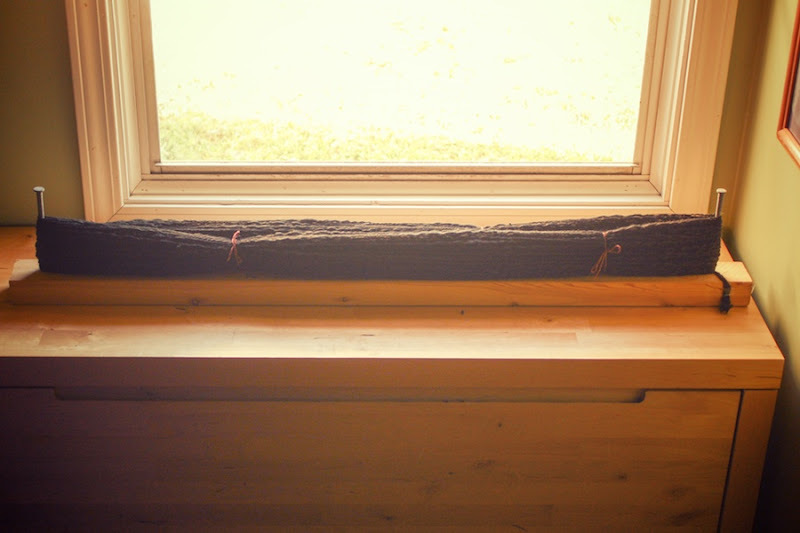 I began looping it around the "ghetto noddy," inspired by Ashley, that my husband built for me all those years ago. I lost count around 250 yards, so I'm pretty sure I have enough. I knotted three balls together for this amount of yarn, but will undo the knots as I come to them in the ball winding or knitting. After measuring my yarn, I tried to tie the skein like I find them in yarn stores, weaving a tie in and out to form three sections at each tie. I don't really know what I'm doing here. 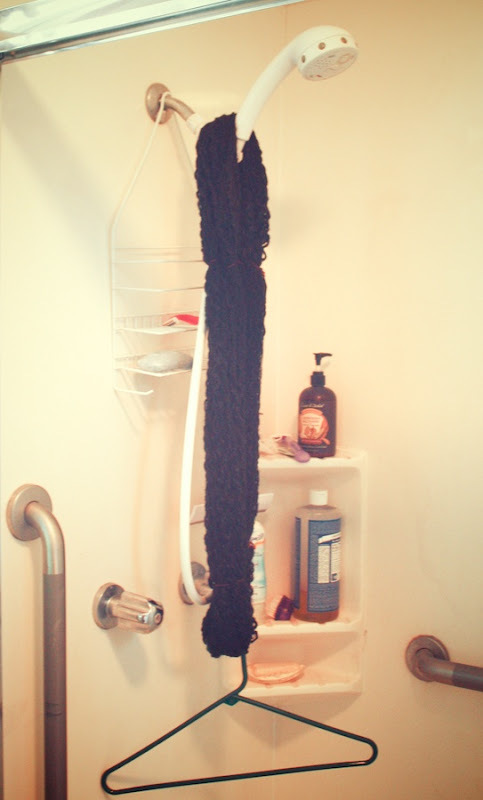 I, then, removed the yarn and twisted it into a skein for washing. It is now hanging in my shower, with a coat hanger to weight it a bit, in hopes that some of the kinks will fall out of it. Now I need to decide what color of old stash yarn I want to hold together with the black to get a super bulky weight yarn. I can't decide: cream, bright red, grey, or burgundy-ish. Here's what I learned: Conservation is a good thing, but I really don't like unravelling. 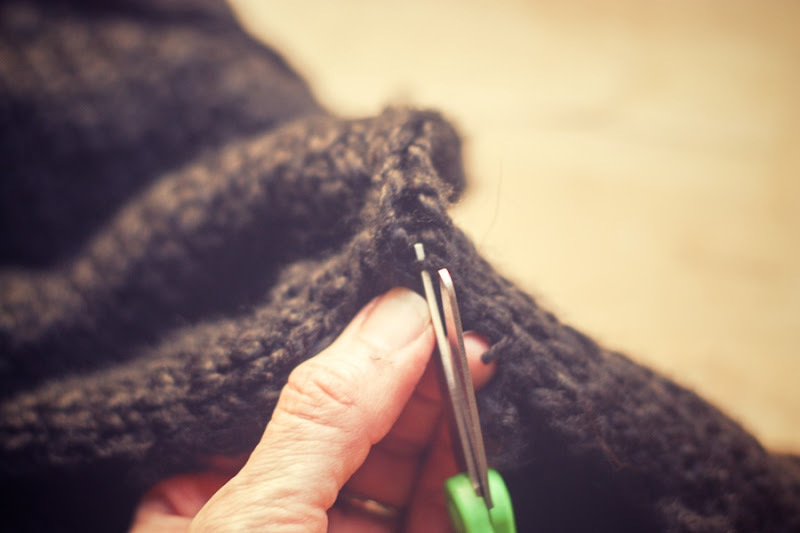 Most likely, I'll be using all of my store bought yarn before I dip into the recycle bin again. I need glasses. 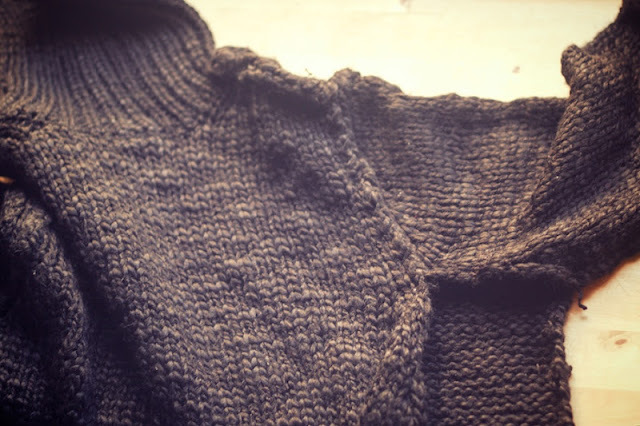 My winding, untangling, and cutting at this sweater was about as precise as Mr. Magoo's would be. I have so much patience with the actual knitting process, often re-knitting sweaters to get them just right, but I truly hate these preliminaries. My shower is a dank and scary place, requiring much photo post-processing. Why Do Sewing Needles Scare Me?